Do you have a future astronaut on your hands? Some interests start young. It may begin with looking at stars as a family in the night sky. But this small spark could lead to passions of NASA-proportions! If riding space shuttles, exploring planets or even encountering aliens is the exact excitement your little one is looking for, K'NEX has you covered. Their Cosmic Quest Building Set may be only the beginning of a life-long interest in Space! Take an adventure into space with the Cosmic Quest building set! With this set you can build 5 models one at a time to create your ultimate space adventure. Build a Mars Rover, a Hover Craft, an Alien, a Space Suit, or a Moon Bike. With over 120 Classic K'NEX parts you can let your imagination soar! 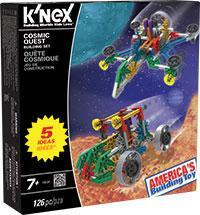 Get started today: The Cosmic Quest Building Set is available at Toys R Us, knex.com and amazon.com.